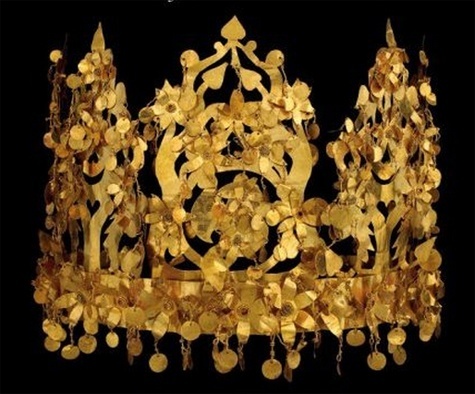 According to archeological finds by Heinrich Schliemann, an elliptical gold diadem with removable crown-ornaments was first discovered in a Mycenaean funerary mound called Grave Circle A, or the “Grave of Women”, c. 1600-1500 BC. The Mycenaeans were an Indo-European people who settled in Southern Greece along the Agean Sea in the Bronze Age (1600-1100 BC). They came in contact with other cultures through conquest, creating a society based on a warrior aristocracy that Homer immortalized in The Iliad. The Mycenaeans were an agricultural people. However, after the Thera eruption weakened Crete’s Minoan civilization, the Mycenaeans conquered the sea-trading culture, c. 1420 BC. A hypothesis: Sea peoples could have spread this crown design to land-trading equestrian nomadic tribes through commerce and war as early as 1420 BC. Narrower bands comprise the next evidence we find. After Alexander the Great died in 323 BC, his empire spanned three continents. It was split up among his generals, the Diadochi, who at first wore white ribbons and then gold bands called diadems. Before Alexander conquered it, Bactria (now in present-day Afghanistan) was located in the eastern part of the Achaemenid Persian Empire and connected eastern and western cultures through trade and war. The Silk Road, which began during the Han Dyansty, c. 206 BC, brought traders, merchants, and nomads to Bactria. In war, the Yuezhi, a nomadic tribe who supplied jade to the Han Chinese, moved south to conquer Bactria after they were defeated by the Xiongnu, c 124 BC. 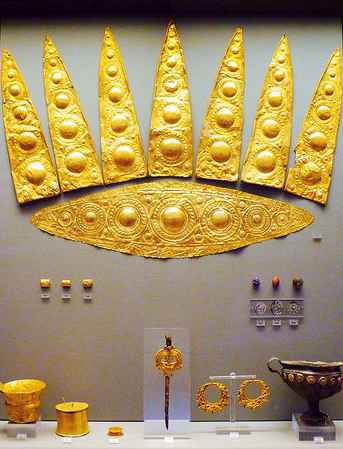 This gives us a significant connection between the Greeks and Han Chinese, as well as the Central Asian and Scytho-Siberian nomads, when it comes to the gold crown from Tillya-Tepe in Bactria. It was found in the tomb of a nomadic Saka woman, c. 100 AD. A plethora of round gold pendants adorns the band and ornaments, which come off easily so they can be packed away. The Silk Road is also how this multi-cultural-influenced design must have arrived in the Silla Kingdom of Korea, c. 400 AD. Lasting from 57 BC to 935 AD, Silla was renowned for its gold. Along with jade decorations, three prongs forming the Chinese character 山 “mountain” shape the front ornaments. 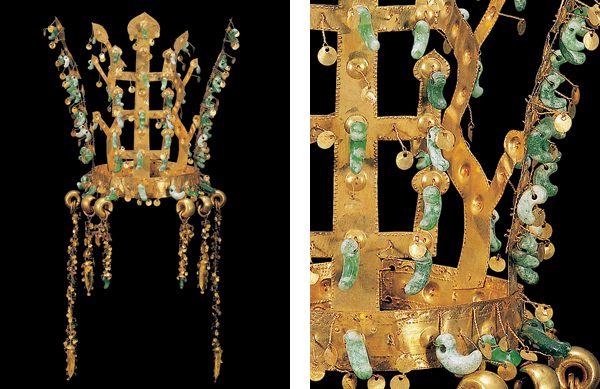 This crown was excavated from the north mound of Hwangnam Daechong Tomb and resides at the Gyeongju National Museum in South Korea. 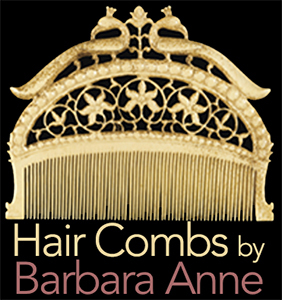 Crowns like this were cut from a thin sheet of gold and were so delicate, some speculate they were worn only for ceremonial occasions or made as a burial ornament. 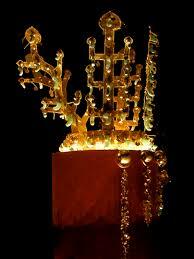 In nomadic fashion, here is how the crown pendants were detached from the band. I also see a Scytho-Siberian nomadic influence in the tiny mirrored gold pendants. What a startling impression that must have made when those pendants reflected sunlight, linking the king with the sun on Earth. 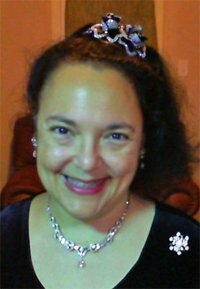 In the Ancient World, crowns represented nobility, conquest, religious significance, cultural tradition, and the exchange of ideas. Before the helmet design, they were made like this. Both ways of thinking seem so unrelated, but in tracing the history of this ancient design, we can map the development of ideas in a world we could hardly imagine.